We’re sure that many of you are aware of France’s national cuisine: baguette, cheeses, foie gras, croque monsieur, crêpes… the list goes on and on. Sadly, we can’t live off of those delicious meals and stay healthy at the same time. Moderation is key when visiting Paris and the best way to do that is by switching it up here and there! 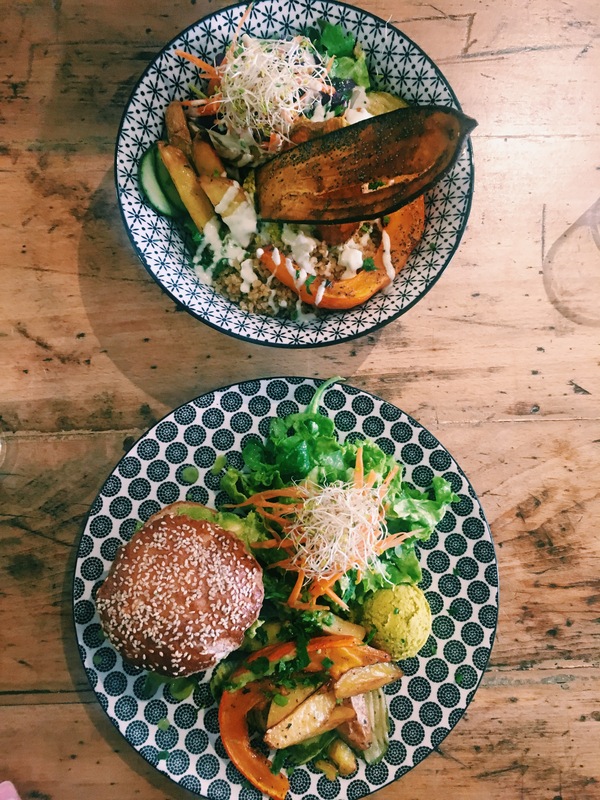 We’ve compiled a list (in no particular order) of healthy (gluten free/vegan/vegetarian) restaurants for you all to EAT your way through Paris the healthy way! This organic, vegetarian, and gluten free restaurant is our number one for a reason. The menu consists of the freshest seasonal ingredients, meaning that it changes about every two weeks. This spot should be at the TOP of your list, trust us! Everyone should visit this dairy-free and gluten-free restaurant just to try their infamous sweet potato waffles! There are both vegetarian and vegan options available at this cute cafe that is perfect for a nice breakfast or casual lunch. This translates to “Market of the Red Children” and let us tell you, you definitely feel like a child running through this cute market filled with a wonderful blend of aromas. Fun fact: This is the oldest covered market in Paris- dating back to 1628! It’s located in our favorite Parisian district, Le Marais. Stop by for amazing international cuisines ranging from authentic Moroccan food, savory crêpes, Lebanese food, vegan dishes, and more. If you’re wandering around the gardens of Palais Royal, make sure to stop by this cute cafe for their delicious matcha green tea latte. If you’re there during the summer months, indulge on their ice cream. You probably guessed it, this place stands for “No Gluten”. This gluten-free bakery/restaurant has a few locations throughout the city and even one in New York City! The chefs’ creativity truly shines through it’s seasonal menu that changes as often as they please. This kosher, Israeli restaurant is Shir’s first stop every time she lands in Paris. If you want the best Israeli food outside of Israel, this is your place. Shir has gone so many times she is now good friends with the owner. It’s located on Rue de Rosiers, which is one of our favorite streets in Le Marais surrounded by cute boutiques and bakeries. We spoke about this restaurant already in greater detail in our Paris city guide, but we couldn’t leave this elegant and delicious bar/restaurant on top of the Haussmann building off of our list. For the best view of the city and the best cocktails and Asian cuisine, this is your go-to spot. This is definitely one of our favorite dinner spots in the world. S&J as babies (three years ago)!!! This organic restaurant is located in the 11th arrondissement right by Oberkampf, which is filled with amazing bars, including tons of speakeasies. We recommend getting the raw lasagna! This restaurant/lounge/club is located in the center of the Bois de Boulogne (a huge park/woods on the western end of the city). To enter Bagatelle’s mansion you must dress to impress; go with a large crowd (make a reservation) to enjoy a large buffet in the gardens with (sometimes live) music. Later in the evening, it turns into an outdoor club and it’s always a good time. S&J’s friend, Dora, who’s a Parisian local! It’s name speaks for itself! This restaurant has an ever-changing seasonal menu with a variety of options. We visited this spot more than once because it’s open all day… by all day we mean 8:30am-11pm. Jamie loves it for not only its amazing, fresh food, but also its gorgeous interior design! We even saw a photographer shooting the location when we were here. Located right across the street from Marché des Enfants Rouges is this infamous café with the BEST hot chocolate you will have in Paris. It’s located on a corner of a busy street, perfect for people watching. During Shir’s first time there, she saw a famous movie director working on his next project! This is the spot for getting your daily, cold-pressed juices. They use all organic and local ingredients and have juice detox programs with a variety of different flavors. If you’re obsessed with matcha like Shir, then get one of their lattes and matcha baked goods! This is a Matcha fanatic’s DREAM. They have imported tons of authentic matcha products from Japan and have an extensive matcha-filled menu. They even have matcha infused pastries like cookies and croissants! If you think we’re exaggerating, take a look at the menu here. As people are becoming more and more health conscious, there has been a huge rise of vegan, organic, and vegetarian restaurants. One can travel almost anywhere in the world and find a plethora of healthy restaurants and Paris is no exception! We know there are way more that we have missed — share your thoughts and give us more recommendations to add to our list for our next Parisian adventure!